I absolutely love cream based soups and was looking for a lighter way to satisfy the need for a decadent, creamy, soup, while still maintaining a healthier lifestyle. The Potatoes in this soup give the consistency of a creamy soup without the fat from milk. In a large pot, add 2 Tbsp. of Olive Oil to the bottom. Add chopped Onions, minced Garlic and the whole sprig of Rosemary to the Oil and let brown. Peal and dice the Potatoes and add them to the pot, then add the Chicken Broth. Let the Potatoes cook in the Broth and when fully cooked, turn off the heat , let the soup stop simmering and pull out the Rosemary. Using and emulsion blender, blend the soup until creamy (if you don’t have an emulsion blender, let the soup cool a little and add the soup to a blender, puree and then add it back to the pot). Stir in the Salt & Pepper (to taste), Nutmeg, and Crushed Red Pepper. Chop the Broccoli into small, bite sized, pieces. In a different pan, heat the remaining 1 Tbsp. of Olive Oil and pan fry the small pieces of Broccoli. 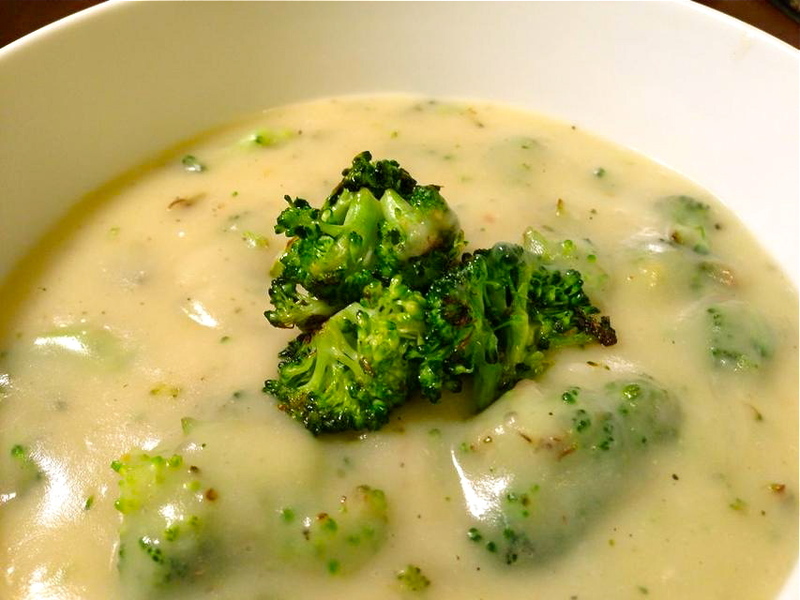 Once cooked, add the Broccoli to the soup, serve and enjoy! Sounds delicious maybe for tonight!